Resume Writers: Do You Need More Marketing Leverage? As small business owners, we're told that networking and one-to-one consultations are great ways to get in front of prospective clients -- and then turn those resume prospects into clients. Think about how you can better leverage your time for more results. As resume writers, we know the importance of headlines -- LinkedIn Headlines, resume headlines ... but if you have a resume writing blog, you also know that the headlines on your blog posts can help you get more readers to your blog. This strategy also works for email subject lines. Trying to find focus. Being overwhelmed. Lengthy to-do lists. All of these are things self-employed resume writers deal with daily. Here are a couple of resources to help you with them. The first is this blog post: "How to Eliminate Broken Focus and Overwhelm with Evernote." I love Evernote. It's like my online memory bank. I keep all my notes there, including conversations with prospective clients, notes from training programs, lists of projects I'd like to get to "someday," and more. I'm going to try the "top 6" strategy. And check out Jonathan's webinar on Evernote productivity here. The second is Kelly McCausey's course, "The Power of a Focused Business." Right now, it's free for a limited time. Just use the code "kellysgift" after clicking on the "Order Now" button. You'll get the downloadable audio recordings and PDFs (including brainstorming worksheets) and two webinar replays. Once you register, you'll have access to it and you'll be able to go through it at your convenience. What do you do about clients who post negative things about your service online? Today's Q&A with Bridget addresses that topic. 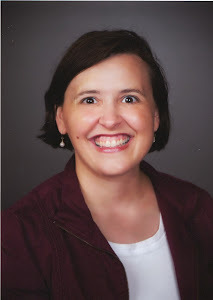 In July, the special report, teleseminar, and Pass-Along Materials on BeAResumeWriter.com addressed working with challenging (or pain-in-the-a$$) clients. You can check them out in this Working With Difficult Clients bundle. Ever consider writing materials about how to handle PITA clients that give you scathing reviews because they want to showboat their frustration and anger? The bad review I got from the one guy even went to the Better Business Bureau. As a result of his review, my last 7 thumbtack bids have been declined before they even consider me. for Yelp, I had 24 views and only 2 clicks to my website or calls. Last night I decided to delete both profiles, which I'll do today. They weren't producing anyway, so why double the whammy with a negative reviews? Plus I had four positive reviews immediately following this bad one and Thumbtack said I could post them there. They did, but Thumbtack won't publish them because they aren't Thumbtack clients, so these four fabulous reviews are lost. They could have bolstered Yelp, but Yelp has a bad reputation anyway. I'm going to restart my blog and do my own marketing. I may switch gears from resume writing or expand it. Either way, how to handle a disgruntled client with a bad review is different in many ways from a PITA client. You might consider what to do about it. Especially when you send them the Client Release Form informing them you can sue for disparagement, but there's enough truth in there that you might lose the disparagement case. I'm still thinking about it. Great idea! I will add that to my possible topics list for a future special report. Online reputation management for resume writers is handled in much the same way we suggest it for jobseekers! YOU control your brand identity and reputation online by creating POSITIVE content so that NEGATIVE content is pushed further down the page. Right now, Yelp and Thumbtack are showing up on the first page of your Google search results -- but unfortunately, I don't think that deleting your Yelp or Thumback profiles will eliminate them entirely (AND deleting them eliminates your opportunity to respond to clients -- both negative AND positive) ... so I would instead make a concerted effort to INCREASE your positive reviews on both sites, while simultaneously REDUCING your dependence on both of them as sources of new clients (Thumbtack in particular). Thumbtack is the equivalent of our jobseeking clients applying for jobs online. It can work, but it's not a great strategy ... you are at the whim of the person at the other end of the keyboard. However, for Thumbtack, go through your client database and look for clients who found you through the service -- and were HAPPY -- and ask them to write a review for you. 1. Standardize your client management process so that all clients have the same intake policy (and you don't make *exceptions* for clients -- as you found out with [client name redacted], that is a RED FLAG for a potential PITA client). They either work with you the way YOU want to, or you don't work with them. AND you need to make sure you meet 100% of client deadlines going forward, because that's critical. 2. TAKE CONTROL of your client marketing. In addition to boosting your positive responses on Yelp and Thumbtack, increase the content you have available out there that YOU control. Posting regularly on Facebook, adding at least one blog post a week, writing articles for third-party sites (these have to be UNIQUE content) like Ezinearticles.com, goarticles.com, etc. You also need to figure out who your IDEAL client is, and identify how to connect with these folks. I've attached the "Attract Your Ideal Resume Client" special report (that was your Bronze member special report in April 2014) and I encourage you to work through it! Do You Know Employment Law? You're a resume writer, not a lawyer. But having a basic grasp of employment law is useful, because it not only informs the resumes you write, but it can help you position your clients appropriately when they have "special" situations. My 16-year-old niece. Her current employer cited a provision in the Fair Labor Standards act that allows employers to pay employees under age 20 just $4.25 an hour for their first 90 calendar days of employment with the company, even though federal minimum wage is (currently) $7.25 an hour. It's also important to keep an eye on changes to employment law. For example, today I came across this article, "Quinn Signs Pregnancy Discrimination Measure" affecting pregnant women and new moms in Illinois. I'm reading Jeff Walker's new book, "Launch: An Internet Millionaire's Secret Formula To Sell Almost Anything online, Build A Business You Love, And Live The Life Of Your Dreams" and it is excellent. Reading Facebook today, I found an interview of Jeff Walker on Forbes.com, sharing seven lessons ("Why Jeff Walker Is The 400 Million Dollar Man -- And 7 Lessons You Can Learn From Him"). I was inspired by this post from Explore B2B of "20 Books to Enjoy, Learn From, and Share" -- and I definitely recommend several of their books (especially numbers 1, 7, and 20! ), but most of these are geared towards entrepreneurs in general, not careers industry professionals. I want to share with you six books for resume writers to enjoy, learn from, and share. The "bible" of resume writing -- the fourth edition (updated in 2010), this book provides practical guidance for resume writers as well as dozens of samples that have held up to the test of time. The most up-to-date "getting started" guide for resume writers. It covers both business management and operations issues as well as pricing, client communications, writing resumes, and more. If you're looking for a no-nonsense system for attracting more clients to your resume writing business in the next 28 days, this guide will help. You choose a set number of activities to engage in daily for 28 days. One of the best books on personal and career branding, this book will teach you -- and your clients -- how to become "digitally distinct." Buyers of the book will also be able to access a workbook to help them build their brand and identity. Taking the 28-day system she developed for Get Clients Now, Hayden partners with Traditi to offer a step-by-step system to help jobseekers develop a system to guide their jobsearch. Updated annually, the 2015 edition provides lots of tools and resources for jobseekers...making this a resource to share with clients. While I disagree with some of Bolles' assertions ("Google is the new resume,") there is enough good content to outweigh the bad (he also discusses online job search strategies extensively, which isn't a great source of new jobs for jobseekers, generally speaking). Resume writers will find his "Starter Kit" questions to be useful to ask clients. Want more book recommendations? Check out my Recommended Reading list! I don't want to scare you, but as someone who has been blogging for 7 years, there will be times when you're writing just for you. People are reading, but not commenting. But the good news is, those posts will be there when someone discovers you for the first time. But you need to be there for them, even when they're not there for you. But if you go for extremely long stretches of time without blogging (because some other part of your life -- or your resume writing business, even -- needs you), you may have a hard time keeping your audience. So read the entire post (yes, the whole thing) ... and take his advice to heart. More and more companies are using phone interviews (and virtual interviews) to screen potential clients. Share these tips ("10 Tips to Master the Phone Interview") from the Talent and Recruitment blog with your clients. The Big Job Boards Are Dead ... But Are Niche Boards Still 'Working' For Clients? The "big" job boards — Monster, Careerbuilder, etc. — have had their heyday … and it's over. Job board aggregators are still working – Indeed.com is probably the best of these. The SmartRecruiters blog has collected 50 of the "best" niche job boards and sites here. Just keep in mind that only 5% of jobs are found online. So you can share these niche job boards with clients, but make sure to emphasize that 95% of jobs are NOT found online! I'm a big believer in blogging for resume writers. It's a great way to establish your expertise by providing information and ideas to jobseeking clients, and can drive a significant amount of traffic (visitors) to your website and generate clients! You can read my blog post from last year on Blogging Basics for Resume Writers for more information on how to integrate blogging into your content marketing strategy in your resume writing business. I came across this article that I want to share with you, "4 Simple Steps to Writing a Blog Post That Floods Your Inbox with Inquiries" -- it promises a "blog post formula" that I can't wait to try! As a resume writer, do you receive LinkedIn connection requests from people, but you have NO IDEA who they are, or why they might be asking to connect? Most resume writers I've surveyed will connect with almost anyone who requests a connection … but they are MORE likely to connect if the individual personalizes the LinkedIn connection request. It includes three examples of personalized connection requests. Do you personalize the LinkedIn connection requests YOU receive? If not, you should! Okay, so the author of the article actually calls it "23 Tips Successful People Use for Social Media Strategy," but it just so happens that I think the tips are good enough that savvy resume writers should consider them to be RULES to follow, not just suggestions. I like how the author focuses on engagement and authenticity. Too many resume writers have a Twitter profile because they think they should. Or do LinkedIn profile writing even though their profile isn't populated and they have fewer than 100 connections. Which is YOUR favorite tip from the article -- and why? What Is The Worst Resume Suggestion You've Ever Heard? Resume writing colleague Robin Schlinger served up a LinkedIn post today, "The 10 Worst Resume Suggestions You Ever Received." Unfortunately, many jobseekers seek advice from well-meaning friends and relatives. Sometimes this advice isn't just unhelpful … it's just plain wrong. Usually, this can be attributed to jobseeker fear. If their resume isn't "perfect," they don't want to send it out — but they're really just afraid of rejection. Instead of 20-30 of their friends and family criticizing their resume (friends and family members who are most likely unqualified to judge the resume, unfortunately), they're afraid of a hiring manager criticizing it. What is the worst resume suggestion YOU'VE ever heard? Share it in the comments below. Q&A: What Good is a Client Agreement Form if PayPal Won't Honor It? Every week, I get questions from resume writers -- when I answer them, I usually excerpt/reprint them on my blog so you can learn from them too! Today's question was about my Dealing With Difficult Clients bundle -- three tools designed to help resume writers identify possible PITA clients and what to do with them if they do make it through your screening process! A question about the client management forms. In my experience I've created a contract that I have all clients read, and sign, before making payment. I've developed this contract by consulting with an attorney and also basing the contract on one I reviewed and obtained from another resume writing service that is owned and operated by an attorney. She knows what she's doing. However, when I've had two clients who wanted refunds and got angry because they were PITA clients, the contract didn't hold up much merit. I've never yet gone to small claims court, but the contract itself isn't recognized as a legal and binding contract by companies like Square or PayPal. How do we as professional writers ensure our contracts are recognized as legal, binding documents with both parties? Of the thousands of resume I've written, I've had to only refund about 3 people. But, as time advances, I'm finding more and more unrealistic clients with hot heads and no idea how to professionally handle a contract, let alone pay a writer up front for work hired and to show they are committed to the project. Of late I've had a couple people disappear, so I collect up front to ensure my services are covered. I can't speak to your experience with Square, but PayPal has backed me up on two occasions when I had clients request refunds and I had signed client agreements. They initially pulled the money, but then requested documentation that they sent to the client's credit card company and I "won" both chargebacks. My only cost was the $10 "investigation" fee that PayPal charges. I'm not sure if you accept both Square and PayPal, but it might be worth your while to have the client sign in the client agreement form that they will use PayPal's dispute resolution service to resolve any disputes. That phrase is probably not binding, but it would be a first step after you talk to the client -- if they're still unhappy, refer back to the contract and ask them to open a dispute ticket with PayPal. On a related note, and I hope you won't take offense to this, but if you are finding "more and more" clients who are becoming problems, you might look at the types of clients you are attracting ... perhaps even unintentionally. I know we've talked in the past about the unemployment in your geographic area ... perhaps putting together an "ideal client profile" and working to attract more of these clients instead of just working with anyone who contacts you might help. Or using the Referral Request form in the Client Management forms PAM to reach out to HAPPY clients that you LOVED working with and asking them to send their friends/colleagues your way. Ever get stuck when you're writing a resume? Psychology Today has published an article, "Want to Be Happier? It's as Easy as 2, 5, 11, 15, 20, 43" that may help you get un-stuck. • "Past performance is the best predictor of future success"
But the next time you're stuck writing a client's resume (or any other task you're procrastinating about), just tell yourself that you'll work on it for five minutes. I use the timer on my iPhone and I set it for 5 minutes. When it goes off, many times I'll keep working ... or set the timer for 5 more minutes. Even if I don't finish it, I'm a lot closer than when I started! What are the tricks YOU use when you're stuck writing a client resume? Resume Writers: Have You Found the Secret Room? Last year, I delivered a teleseminar for the National Resume Writer's Association on: "Ask Better Questions; Write Better Resumes." Asking clients the right questions to uncover their skills, gifts, and accomplishments isn't always easy. In addition to the strategies I outline in the teleseminar, and in my book, "Write Great Resumes Faster," check out the "Secret Room" -- 20 industry-specific questions for professions -- compiled by Career Thought Leaders. Are you doing your best work? Are you doing GREAT work? 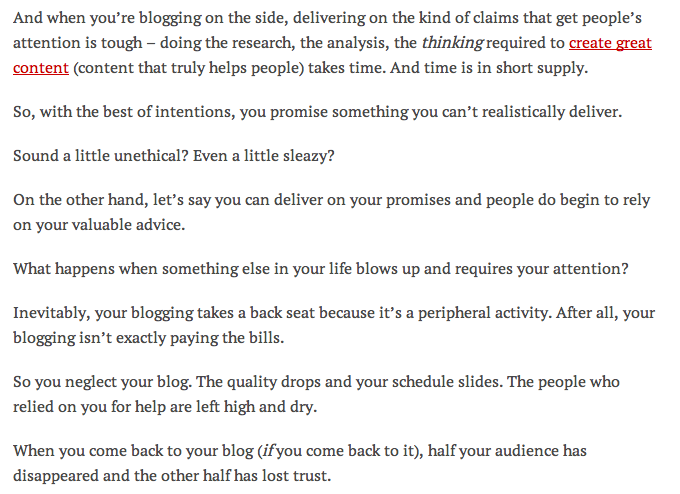 Seth Godin, always one to challenge us to think differently, had this very short post on his blog this past week, and it's food for thought. Not only doing great work makes us uncomfortable, but being challenged about it can make us uncomfortable. I'm guilty of sometimes saying, "I'm doing the best I can." But am I? Probably not. In reality, like Godin says, "I'm doing the best I'm comfortable doing." I can probably do more. Can you? 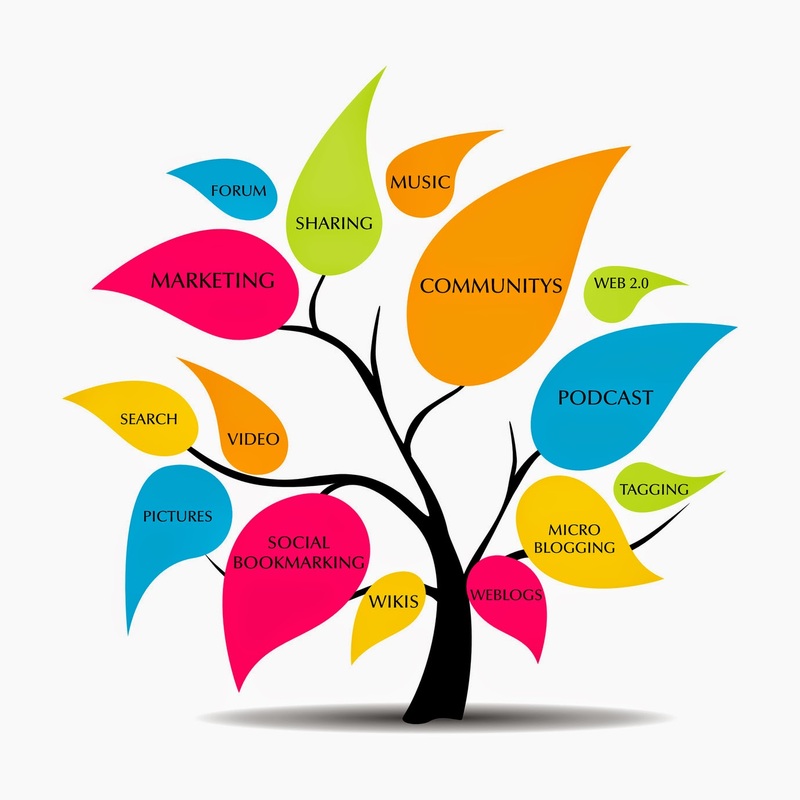 One of the best ways to populate your blog and social media profiles is content curation. And one of the best tools for content curation is Listly. "Getting Started with Listly: A Beginners Guide"
It has a great "getting started" guide plus ideas for how and what to curate. If you're struggling to figure out what to share on your social media profiles, create lists of other resume writers, recruiters, HR pros, and others in the careers space and share the resources you find. Don't be afraid that by sharing information from other resume writers that prospective clients will choose to work with them! Instead, they'll look to you as an expert who shares the best stuff! Although the first resume I wrote, at the age of 12, was technically a federal resume, I don't write federal resumes anymore (unless it's for a friend or family member). That said, I do like to keep up on trends. And Robin Schlinger is one of the top federal resume experts in the U.S., so I recommend you read her LinkedIn column, "Federal Resumes: What Has Changed?" I agree with her assessments -- getting hired for a federal position has become much more difficult in recent years, and her five-part assessment of "why" is right on track. And the four questions you can ask clients to assess their likelihood of being hired is an eye-opener. At the age of 40, my husband took up novel writing. So I love seeing stories about successful people who began new careers at "ripe old ages," because when you work with jobseekers, so many of them find themselves starting over again … and sometimes they're not what they themselves would consider to be "spring chickens." So when I came across this article from Inc. magazine, "Accomplish Great Things at Any Age," I just had to share. You're never too old to start something new. And if you wait until tomorrow, you'll just be a day order. So don't wait. If there's something you've been wanting to try, just Start. When I was in sixth grade, I remember learning about the concept of portfolio jobs. It was the "workplace of the future." Instead of having a job that lasted years and years, you might have two or three "project"-oriented jobs each year, working on defined tasks and then moving on. Or you might have a couple of part-time jobs instead of one full-time job. That was back around 1984. In the intervening years, job tenures did become progressively shorter, and the "lifetime" job, where you started in the mailroom and retired as CEO, all but disappeared. The portfolio job hasn't really materialized … but the idea lives on. I was reading the July 7-13, 2014 issue of Bloomberg Businessweek and came across a book review by Bryant Urstadt reviewing The Alliance, a book written by LinkedIn co-founder Reid Hoffman and entrepreneurs Ben Casnocha and Chris Yeh. In the book, Urstadt says, Hoffman suggests keeping employees engaged by "setting up 'tours of duty' involving specific tasks such as managing groups, then mining the networks they form." While not exactly the definition of portfolio careers I learned in the sixth grade, it's interesting that the project-oriented career is still being explored. It works well in Hollywood, where the "gig" lifestyle is geared around a movie: People are hired, do their jobs, and then move on to the next project. Perhaps it's coming to the Fortune 500 company near you. As resume writers, it's something to consider. Maybe there will be a whole new resume format that arises to help meet the need of describing this project-oriented career. After all, as anyone who has ever written a resume for an IT consultant or project manager knows, those resumes can easily stretch to 4, 5, or even 6 pages or more. Urstadt writes, "Hoffman's ideas have grown out of an environment where young workers with elite backgrounds and big personal dreams are feverishly recruited under the guise of changing the world." These are the clients who will be hiring us. If not now, they will soon be. Every day, I read the excellent writing of my resume writing colleagues ... and I wanted to make sure you're aware of them too! Got five minutes? 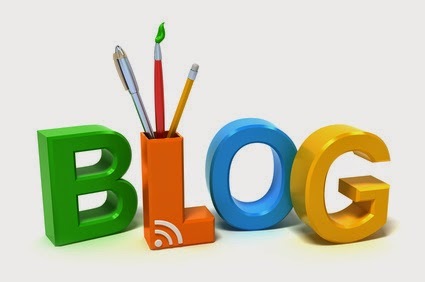 Check out these three blogs. They're all "Bridget-approved" as being "resume-writer friendly." That means you won't find information on these blogs that I wouldn't share with my own clients. "The Secret To Finding Your Accomplishments Or Resume Stories"
She uses nautical themes and imagery to guide career journeys. "How To: Word Cloud and Key Word Analysis of Job Descriptions and Resumes"
Every day, I get questions from resume writers! I reprint many of them on here to help other resume writers! Here's today's question! I just updated my client agreement and some of my other forms and my graphic designer created some pretty PDFs for clients to fill out. How do I make these PDFs fillable forms so the clients can just put the information online and send it to me? It's now available as a monthly subscription vs. what it used to be as a one-time $$$$ cost. There's also folks on Fiverr.com that will do this for you for a small fee. The second is to use an online form builder. You can also link FormSite to payment providers (like Authorize.net and PayPal) so that the client can securely provide their payment information online when they submit their information too. JotForm (http://www.jotform.com) probably has similar functionality and like I said, if you use WordPress, you can use online forms like Gravity Forms, Ninja Forms as WordPress plug-ins. The third option is a fillable Word document. I hope one of those solutions helps! Note: None of these links are affiliate links, and I can't vouch for any of the services mentioned, except FormSite, which I personally use. This is the latest in a series of Q&A posts. Every day, I get questions from resume writers -- and I share my answers publicly with you! I’m finding that I’m spending way too much time on the interview process (I sort of knew that already), and I’d like to figure out a way to streamline that. Do you have any good resources for the client interview process? What I’m doing is creating and emailing them a customized word document (from a template I’ve created) with questions specific to their career, taken from their resume (to add detail to good bullet points), and job posts that they send me (I require that they send at least one – I create questions to fill in missing information on their resume which the job post specifically calls for), questions lifted from Resume Writer’s Secret Room, as well as information about their technical proficiencies, leadership skills, employment gaps, etc. etc. The customized interview definitely works very well in terms of getting the info for an exceptionally good resume, and clients have repeatedly told me that the interview has made a significant difference in their job interview preparation. It’s an awesome service for my clients. However, it takes me up to 2 hours to prepare the interview, and some clients come back to me wanting to deliver their responses via phone or in person, which can take up to an additional 2 hours for complex projects. Four hours spent on the interview alone is NOT a profitable process! I’d like to cut back on the amount of time I spend on this process, but I don’t want to lose the value of what I’m providing. I put my clients through what more than a few have called a “grueling” resume development interview, and they come back and thank me for it and refer their friends. I’m constantly tweaking my interview template document, removing standard questions that don’t work or adding standard questions which can streamline the customization process. When I customize the document for a client project, I delete the questions or sections that don’t apply and add questions specific to their resume/career. That’s helped a little, but not enough. I have a couple of resources and suggestions to offer. The first is already included in your Bronze BeAResumeWriter.com membership. You'll learn how getting better at the pre-writing process will help you save time on the resumes you write. It's also about collecting the RIGHT information. This one specifically addresses the information-gathering process. A related issue that I see is that you don't feel like the time you're spending is "valuable" (you said "profitable") -- which usually suggests that you're not charging enough! One way to direct clients to do things YOUR WAY is to give them the option, but CHARGE MORE for the way you LEAST prefer. For example, if they provide information via custom questionnaire (which is the strategy I use with clients, and I do it just like you do! ), the cost is "x." If they don't want to do a form and they want me to interview them to collect the data, the cost is "x-plus" -- with the "plus" being the value you place on your time (your billable hour rate x the number of hours to conduct the phone interview -- i.e, x1 or x1.5, etc.). Or, alternatively, refer out clients who want to do a phone consultation (partner with a colleague who prefers to work that way, and negotiate a referral agreement for a 15% referral fee). Why Create a Membership Program in Your Resume Business? A membership site — or a membership program — is an extremely valuable tool for resume writers and career coaches. It is a great way to create customer loyalty and establish a reliable revenue stream that will help your business grow. But the value of a membership program is often times misunderstood. The true value of membership program is not the additional sales. It's not even the cash (although that's nice!). The true value of membership programs is all about the customer. The value of the program is all about gaining new clients and hanging on to the ones you already have. A successful membership program requires an investment from you. An investment of your time, your money and of your expertise. Membership programs are the art of acquisition and retention. Membership programs can and will increase your revenue stream. Membership programs inherently builds loyalty through mutually beneficial customer relationships. Apply the multi-level membership model to your program to entice more customers to become members. Nothing adds value like offering value. Communication. Communication is absolutely critical to the success of your membership program. You must communicate with your members to let them know you are committed. You also want to serve as a constant reminder that your business is of value to them. They have to be made to feel as though they need you, because ultimately, you need them. Innovation. Whether its possible or not, you must always be certain to stay abreast of new and exciting products and offerings in the careers industry. Keep informed about what is going on in the world of job search and help your members take advantage of these new trends. Dedication. No matter what element of your business, be it your resume writing services, career coaching, your list or your membership site, the level of your success will be directly related to the level of your dedication. The more dedicated you are to your business and your clients, the more success you will see. These themes are not "new" but remain absolutely critical to the success of any resume writing business. Why? Because without communication, your clients wouldn't know who you are or what you have to offer. Without innovation, your resume writing business can never move forward. And without dedication, you will not succeed. All of the important principles you have applied to make your business successful still apply. Your membership site and program should simply serve as an extension of your efforts. However, what happens when their membership expires? How do you keep your clients coming back for more? The key to customer renewal is value! You must entice with value, deliver value, and entice with value again. For example, when initially trying to entice a client to become a member, you may offer a free special report or benefit as a perk to signing up for your program. People love free stuff! Don't you? Once you have made this promise, you then must deliver on it. In other words, make sure you provide them with that product as soon as possible so they know you can be trusted. And reinforce your value by enticing members with value again. One of the ideas I've had for a membership site is to make resume updates profitable by tying them to a membership program. For example, if an existing client becomes a member of my membership site at $10/month, after one year, they receive a resume update certificate. Getting them to update their resume every year is a good idea anyway, and this way, you're receiving ongoing revenue from the client in the meantime too … while also staying in touch with them regularly so you can market affiliate products and services to them too! Incentives are absolutely critical to gaining clients and renewing memberships. The incentives you offer should add a high perceived value to your clients without costing you much if any resources at all. You may want to offer a set discount for membership renewal, exclusive free bonus materials for returning members only, or both! Just be careful not to give away everything for free. You must be strategic when offering incentives. There are many reasons membership programs are valuable. But clients are at the heart and soul of what makes this so true. Without members, there is no revenue stream. And without a revenue stream, your membership site has no value. Therfore, the true value of membership marketing is the customer. If you apply these basic marketing principles to all that you do, coupled with the knowledge of how to provide value to the job seekers you serve, and a well-devised membership campaign, and you will achieve success. Now, get out there and make it happen! 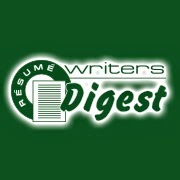 Here's another one from the Resume Writers' Digest mailbag! I just recently listened to your presentation on Ask Better Questions and found it to be most informative — especially to a newbie such as myself just starting the process of develpment of my resume business. I would like your feedback on just how you went about structuring your fee schedule. What do clients seem to be drawn to: a fee set for each step of the process or an all inclusive package and most importantly which form provides you the best revenue source? And finally, in what methods do you accept payment? And at what point during the crafting process is payment expected? 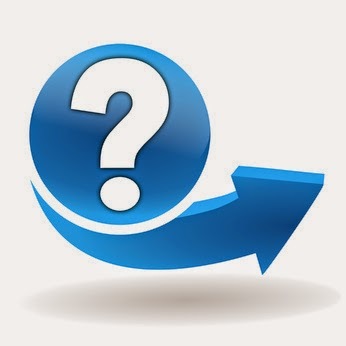 I ask the client a series of initial questions — including whether they're updating an existing resume or starting from scratch, how long ago their existing resume was updated (if applicable), what their job target is, how soon they need the resume, how they plan to use the resume, etc. I also ask for their email address and tell them I'll send them information about my services, samples (sometimes! ), and a custom quote. Based on the information they gave me, I quote them an individual project price (usually as a range — i.e., $349-$399, plus Omaha/Nebraska sales tax if it's a local client) for a resume and cover letter. I also look at their LinkedIn profile (if they have one) and provide an additional quote for LinkedIn profile development (which includes my 8-day "Leveraging LinkedIn For Your Job Search" program). I base my pricing on a $55/hour rate, but I don't include that information in the quote — instead, I might calculate that I'll spend 1.5 hours on information gathering, 4 hours on writing/draft development, and 1 hour on project finalization. That would be 6.5 hours @ $55/hour or $357.50. So my $349-$399 quote covers me if it takes as long as I expect ... and a little bit of wiggle room if it takes longer. Because I've been in business writing resumes for almost 20 years, I have a pretty good idea of how long it will take me to write that client's resume, based on the existing information I have from them, what I think I'll need, what they already have (existing resume vs. starting from scratch) and their job target. I collect a $100 deposit up front (via check or PayPal) and the balance is due when I deliver the resume draft. Some resume writers do a deposit like I do, some collect 50% up front, and some collect full payment up front. I like the $100 deposit approach because it covers my time to put together their custom questionnaire, but if they don't get back to me with the completed questionnaire for a while (or at all! ), I'm not having to worry about me owing them services. (In Nebraska at least, services that are paid for but not rendered are technically considered to be "unclaimed property" and should be turned over to the state after a certain period of time.) I send the questionnaire via email when I receive the deposit (I don't wait for the check to clear the bank before sending the questionnaire). You can certainly offer a la carte options (i.e., resume for this price; resume and cover letter for this price) but I find that the package approach is attractive to the customers I work with. They get a resume, cover letter, reference page, and letterhead template for one price. As I said, LinkedIn profile development (headline + summary usually) for an extra fee. The most important thing is for YOU to decide what YOU want to do and then take ownership of it. It doesn't matter what "every other resume writer" is doing, or even what other resume writers charge. 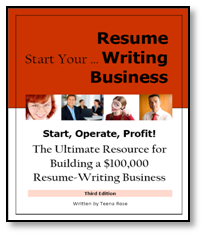 There have been a couple of folks who have jumped right into the resume writing industry and started charging $1000 for a resume and cover letter within their first year. It's your business... it's up to you!